The Appalachian Mountain Club was formally founded in Boston in 1876, long before skiing began its slow climb to acceptance and popularity. According to one founder writing in 1904, the decisive discussion had taken place on Mt. Attitash, which 90 years later would become a center of Alpine skiing, a pursuit the club founders could not envision but that their fledgling club would do much to popularize in New England. Its role was especially important in introducing three elements that helped skiing grow rapidly: Modern Arlberg ski instruction; the mechanization of access to ski terrain via rail; and the first nationwide specialized ski publication. In the 1920s the ski gained some acceptance as an alternative to the snowshoe for winter forays on club trips. The AMC’s first ski trip was in February 1925, and weekly ski trips were scheduled in the winter of 1927. 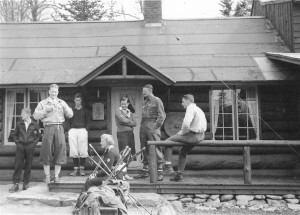 A Committee on Skiing was formed and weeklong trips to the Laurentians beginning in 1928 attracted many. Not all AMC skiers were socially inclined in their outings—Arthur Comey, one of the most intense of them preferred demanding goals pursued by very small groups, ascending Katahdin and traversing Mt. Washington in the later 1920s. The skill level of most AMC skiers at this time was minimal; in this respect they were no better or worse than skiers anywhere in the U.S. 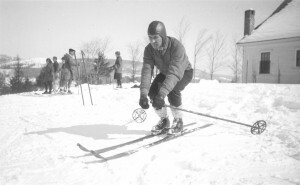 In the 1927-28 ski season, though, German émigré Otto Schniebs appeared in the U.S. Accounts vary about how he came to the attention of the AMC—one says he skied on the Boston Common, one has him on Waltham’s Prospect Hill, but in both versions law enforcement had to untangle the resulting traffic jam. Otto Schniebs demonstrates the Arlberg position on an AMC trip about 1930. What is clear is that by the winter of 1929 he was teaching lessons to the club on metropolitan golf courses and on the AMC’s Littleton, New Hampshire weeklong excursion. Schniebs was the first instructor trained in the Arlberg technique to teach in the US; after several years honing the skills of AMC skiers he became a legendary ski coach at Dartmouth. When skiing became an AMC enthusiasm, the staid club rules would not permit Sunday trips. A group of club skiers subverted the official stance by circulating informal notices of Sunday ski trips, complete with weather forecast and planned location. This was the genesis of The Ski Bulletin, first published in the 1930-31 season. A club committee collected snow reports via telegraph from multiple skiing venues, published and circulated a small pamphlet each Thursday, and announced ski trip destinations on the basis of the updated conditions. The network of snow reporters grew each year, and by the end of the decade The Ski Bulletin became a substantial national publication, the first in the country. The Ski Bulletin worked in conjunction with another AMC experiment of the same season, the Boston & Maine Railroad excursions that became known as the snow trains. AMC member John Holden, who saw ski train excursions in Munich while abroad reported on the concept at a club meeting, and Park Carpenter, another of the early club skiers, brought the idea to the B&M, which was desperate to rebuild its faltering ridership. The first trip was run in January 1931 to Warner, New Hampshire, and over 8,000 riders were counted that first season. The snow train became a fixture of New England winters into the 1950s, and the concept was exported to many locations outside of the region. The low price and convenience of the snow trains allowed many in the middle class to take up skiing at a time when automobile ownership was not widespread. 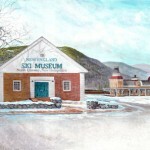 The AMC itself was landlord of one proto-ski area, at Pinkham Notch New Hampshire, situated in promising ski terrain, and in 1934 it purchased a farm in southern New Hampshire near Mt. Cardigan and set about building a second ski destination. 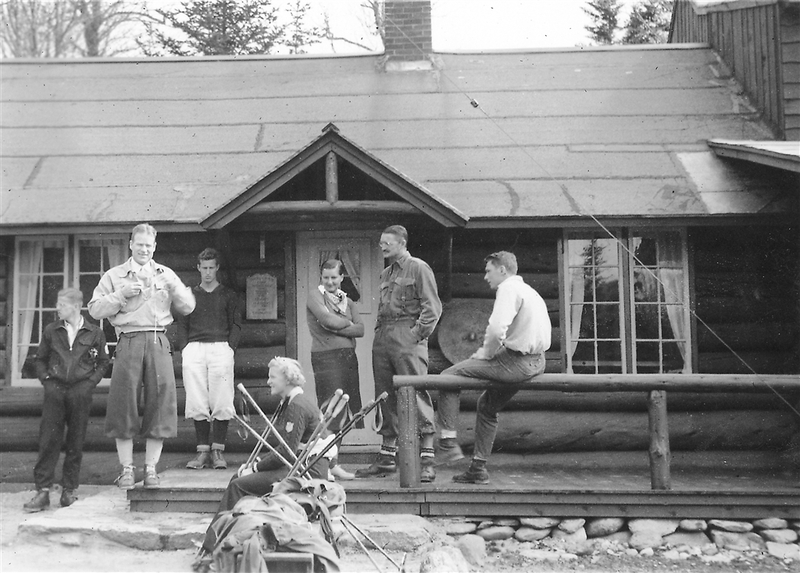 The woods-wise, jovial, profane hutmaster of Pinkham Notch Camp, Joe Dodge, found himself at a focal point of skiing activity as interest in the sport grew, and worked to extend the AMC into the multi-faceted role of ski lodge proprietor, ski race organizer, and rescuer of last resort. The invention of ski lifts in the 1930s changed the rules, however, and as it became clear in the 1950s and 1960s that lift-served resorts would mean wide trails, long lifts, and real estate development, the interest of many club members waned. Their inclinations were always toward using skis as a means for exploration of the mountains and the wilderness. By about 1970 the AMC’s attraction to skiing recast itself in the direction of the Nordic side of the sport, encouraging and enhancing the wave of popularity that had eluded cross-country skiing in America before that time. Just as club members’ interest in Alpine faded in the 1950s and 1960s, a significant number of AMC’s former hut and trail employees became involved in ski area development and operations. Of six major ski areas in NH today, AMC employees had a hand in starting four—Wildcat, Attitash, Waterville Valley and Loon. 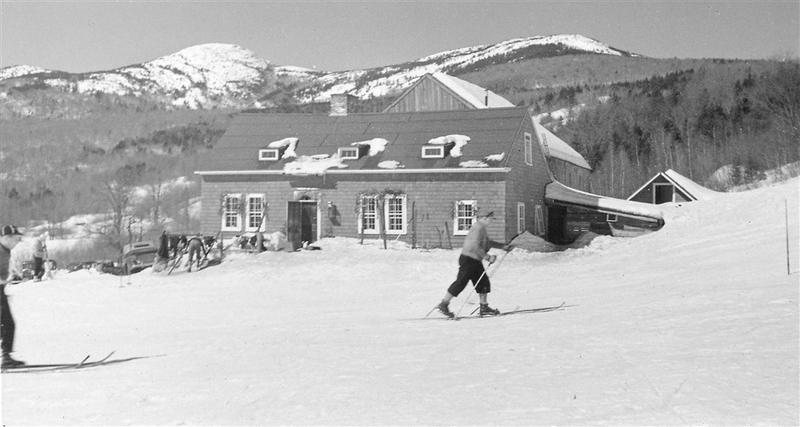 In Massachusetts, former club staff founded or ran Butternut Basin, Mt. Tom, and Bosquet’s. Killington, the National Ski Areas Association, and Skiing magazine were led for a time by people who worked for Joe Dodge at Pinkham Notch Camp; all played parts in the unexpected role of a Boston-based outdoors club in expanding the sport of Alpine skiing.